1 x King Master Bedroom Suite, 2 x King Bedroom Guest Suite, 3 x Queen Bedroom Guest Suite, 1 x Twin Bedroom Guest Suite. Aspen Red Mountain Estate is accessible by commercial and private airline into Aspen airport, helicopter, taxis and rental car. Aspen Red Mountain Estate is a luxurious and ultra deluxe 7 bedroom, 7 bathroom villa located in the midst of Aspen, Buttermilk and its surrounding mountains. The exquisite 12,000 sq ft residence features breathtaking views from the Great Room which boasts vaulted ceilings, south facing windows, hardwood floors, a large sunken 6 seater bar and a magnificent double fireplace adjoining the 12 seater dining room. A gourmet kitchen is also featured on the main level, complete with wet bar, Viking Range, 2 dishwashers and marble countertops. The breakfast bar is set in an octagon area at the south-facing windows overlooking the stunning mountain views. The outdoor patio features 2 BBQ grills and a hot tub. 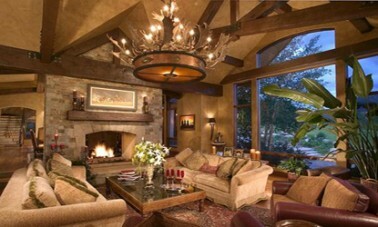 The nearby living room offers a big screen TV, VCR, DVD, stereo system throughout and a fireplace. Just off the 3 car garage entry there is a mudroom and powder room and an extra refrigerator/freezer in the pantry. A complete exercise room is located half a level down, with step, treadmill and a massage bed. Downstairs there is also a large game room with a pool table and mini bar, a full media room with a fireplace and a wine room. Villa facilities include a spa pool, security, gym, game room, media room, pool table, fire places and outdoor bbq. There is a full time housekeep and caretaker, phone, fax, satellite TV and internet access. Facilities in the area include a hospital, tennis, golf, fishing, hunting, horseback riding, biking, hiking, snow skiing, snow boarding, cross country skiing, sledding, cultural tours, historic tours, world class culinary experiences, music festivals, night life, religious facilities, art museums and shopping.